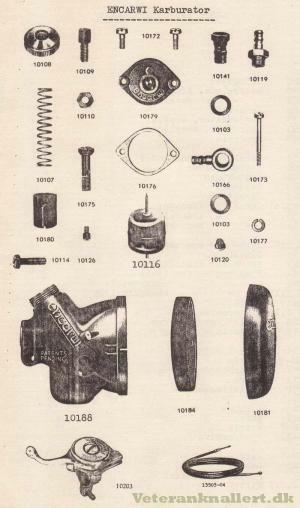 – Used on 1976-83 Tomos A3 mopeds. 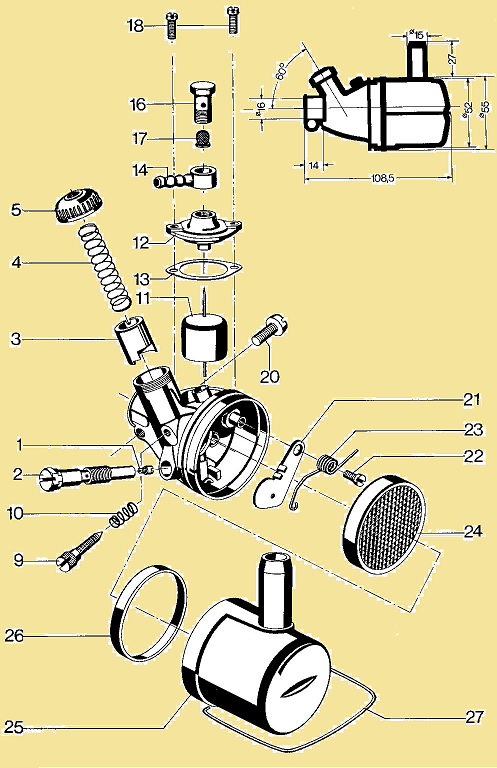 – Located above engine, difficult to remove. – No choke cable. Choke is part of throttle. Left, 1974-83 Tomos carb, Encarwi A83, bare. The jet and jet holder unscrew from the side hole. The jet can be cleaned out easy, on the roadside. Right, 84-86 Tomos, Encarwi 88A85/103, complete. The side hole is blocked. Jet access is from bottom. The engine must be lowered to access the jet. Jetting/servicing is ten times more difficult. At right is a 88A85/103 with the non-removeable jet-holder-spray-tube removed. 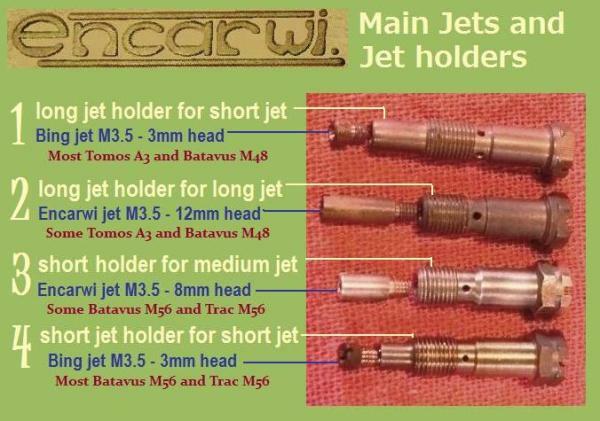 The jet is a 4mm thread, not 3.5 like all the other Encarwi jets. This one was not a tight fit and needed epoxy to hold it. When the jet was unscrewed the whole brass tube turned. – Used on 1976-79 Batavus, 1977-78 Badger. – Needs longer throttle and choke cables. 1a 335200 generic short #52=0.520 $4.00 subst. 1c 334900 generic short #49=0.490 none subst. 1d 334800 generic short #48=0.480 $4.00 subst. – Made special for Laura M56 engine. Encarwi Jets: Most Encarwi carburetors use standard Bing 3.5mm jets. Those jets have a “short” head that is only 3mm long. To use a short jet, the jet holder must be for a short jet. But some Encarwi carburetors have longer 3.5mm jets with 8mm “medium” or 12mm “long” heads. 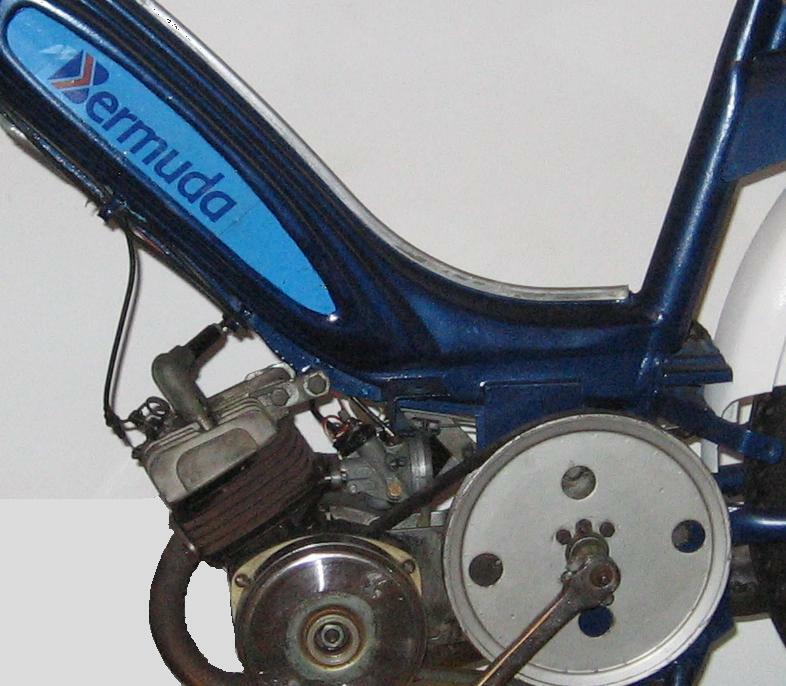 Before 1973, Tomos had Puch and Laura engines. The 1971 Tomos Automatic N had a Laura M48 engine with Encarwi carburetor. 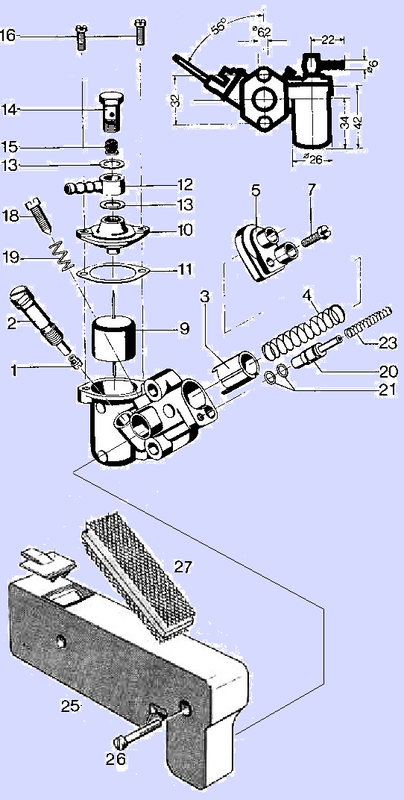 Tomos continued to use Encarwi on their A3 engine, until 1983. Welcome. Encarwi (made in Holland, now the Netherlands) was a division of Bing (Germany). 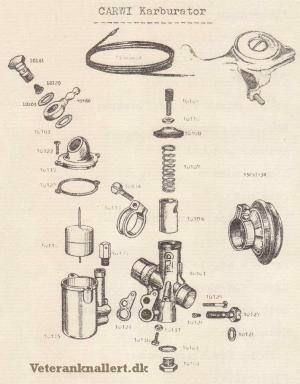 On US models, Bing-Encarwi carburetors were used on mopeds by Batavus and Badger, with Laura (Holland) engines, Flandria (Belguim), and pre-1986 Tomos (Yugoslavia). Encarwi carbs on US models of Batavus and Tomos. Top, S-series. Bottom, A-series (no idle screw). 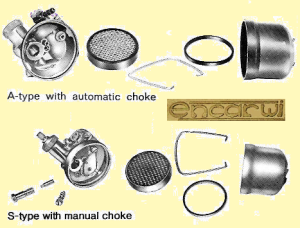 Encarwi “A” series carbs had an “automatic” choke, controlled by a special twist throttle with thumb button. The choke button lets the throttle twist opposite, below “zero”. This exposes a hole in the slide valve, in front of the fuel nozzle. After starting, twist throttle and choke clicks off automatically. All of these jets have 3.5mm threads except for the 88A85/103 which has 4mm threads. Encarwi “S” series carburetors had a “standard” choke, controlled by a small lever on the handlebar via a cable. 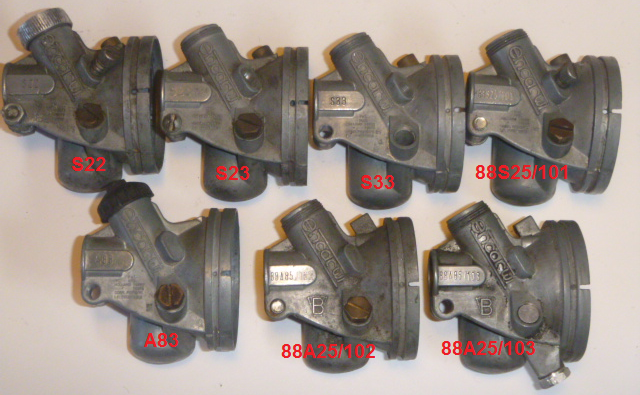 Encarwi “H” series carburetors were designed specifically for the Laura M56 engine, later made by Trac (Daelim). 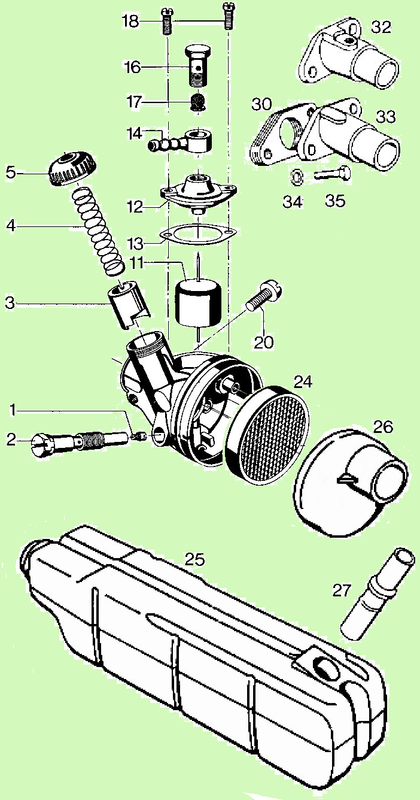 Top, Encarwi carburetors, engine view, with slides slightly open, showing the idle air channels or slots or holes. 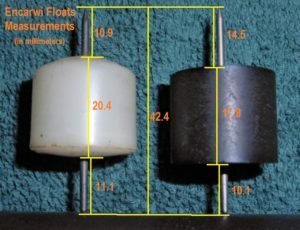 Bottom, the corresponding throttle slides, all 14mm diameter, bottom view. The pair of large holes is for the cable. Substitutions or conversions: Any S-type slide can be drilled and machined to be made for an A83 or H12 carb. The S-type slides (190, 405, 188, 167, 2) all interchange, but have different idle mixture idling behaviors. The Tomos A3 slide 426 fits a Trac M56 with H12 carb, with only minor widening (drilling) of the sprayer hole. 1. Full power – throttle cable is pulled all the way. The slide does not have to be there. Main jet controls the mixture. 2. Partial power -throttle cable is pulled part way. The slide limits the amount of air. The main jet controls the mixture. 3. No power (idle) -throttle cable is pulled slightly. The slide blocks most of the air. Idle slot size controls the mixture. 4. Cold start – throttle cable is not pulled at all. 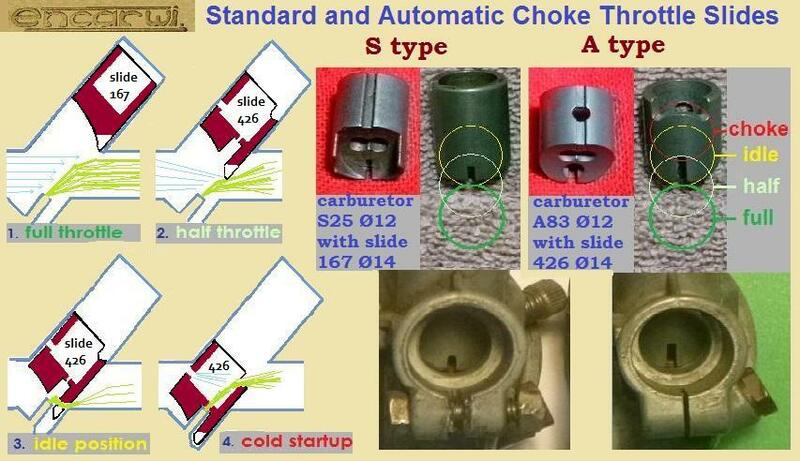 The choke jet hole and choke air hole in slide 426 control the mixture. Substitutions or conversions: The S25 and A83 Ø12 carbs are the same, except for the throttle slide and idle screw. The Ø14 throttle slides 167 and 426 are nearly the same, except the Auto type 426 has extra choke holes and cut outs. You can see that these early Encarwi carbs have many things in common with the later ones. The most obvious thing is the angle of the throttle slide with the venturi. 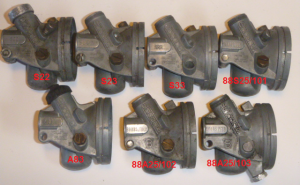 Most carburetors have the slide valve 90 degrees to the air flow, but Encarwi carbs are more like 60 degrees. 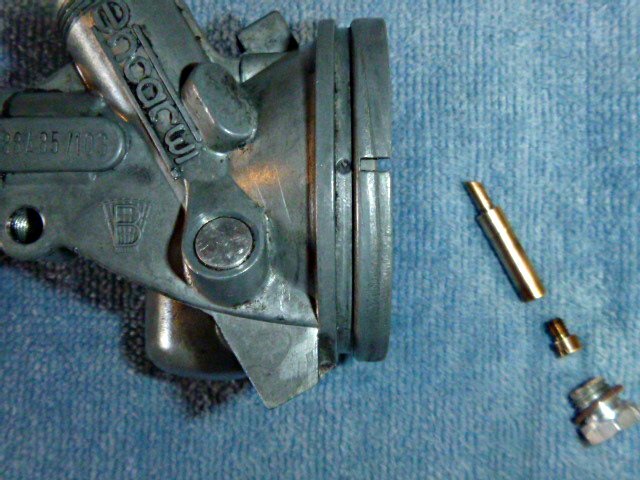 The other thing unique to Encarwi is the “automatic” choke, indicated by the absence of an idle speed adjustment screw, the choke holes and cut-away in the slide, and an extra thumb button on the throttle control that lets the throttle cable go completely slack, below normal idle or “zero”. This entry was posted on Saturday, October 25th, 2014 at 7:52 am and is filed under Encarwi. You can follow any responses to this entry through the RSS 2.0 feed. Responses are currently closed, but you can trackback from your own site.